Roomba maker iRobot has big plans for its automated vacuum bots, but it could involve gathering up something a little more personal than dust and crumbs. 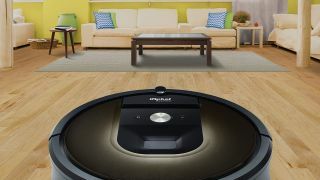 iRobot CEO Colin Angle thinks the future of the company's floor cleaning hockey pucks may lie in using them to map the layout of customers' homes. In an interview with Reuters, Angle claims that while the Internet of Things boom has resulted in everything from smart thermometers to smart speakers, those devices still have a ways to go in terms of spatial awareness of their surroundings. "There's an entire ecosystem of things and services that the smart home can deliver once you have a rich map of the home that the user has allowed to be shared," said Angle. Using regularly updated data from a patrolling Roomba, for example, smart speakers could better adjust to a house's acoustics, or a smart thermostat could take your home's square footage into account for more accurate heating or cooling settings. While promising, some customers may find the data collection less than beneficial to their sense of privacy, especially since iRobot appears to be interested in selling said data to the highest bidder. Advanced models of iRobot's vacuums like the Roomba 980 already use a proprietary technology known as Simultaneous Localisation and Mapping, or SLAM, to get a lay of the land when cleaning house. Angle's vision for this technology is to gather home layout data not just to help the vacuum stay on course, but also sell that data to third parties to improve their own smart appliances. While companies like Amazon, Google and Apple would likely pay big money for that kind of data (Amazon just recently made select Roomba devices compatible with its Alexa digital assistant), the idea of a smart vacuum recording floor plan data for sale does raise some privacy concerns. One of the biggest drawbacks of digitally connected homes is the risk of hacking or otherwise compromising a user's private data. Even if iRobot can promise secure handling of its customer's home layout, the same can't be guaranteed for other companies using the same data for their own devices. That said, Angle adds that if iRobot ever does go into selling collected home data from its Roombas, it wouldn't do so without customer permission. While that's a small comfort, we wouldn't be surprised if iRobot's newest initiative has users of its cleaning robots feeling a little dirty.